Aravan village, Osh region, 2010. (c) Elyor Nematov. All rights reserved. Echoes of the 2010 conflict between Kyrgyz and Uzbeks continue to be heard in the Osh region in southern Kyrgyzstan. The four days of clashes between the two communities left hundreds dead and thousands injured, and came on the heels of the violent change of government in the country in April 2010. Today, it is clear these events have strengthened nationalism and re-traditionalisation among the Kyrgyz people. In turn, this process has worsened the conditions of ethnic minority groups in Kyrgyzstan, especially for the country’s sizable Uzbek population. This trend also affected gender issues among the Uzbek community. Kyrgyzstan ranks 120 out of 188 countries in the world in UNDP’s Gender Inequality Index (GII), just after South Africa and before Iraq. 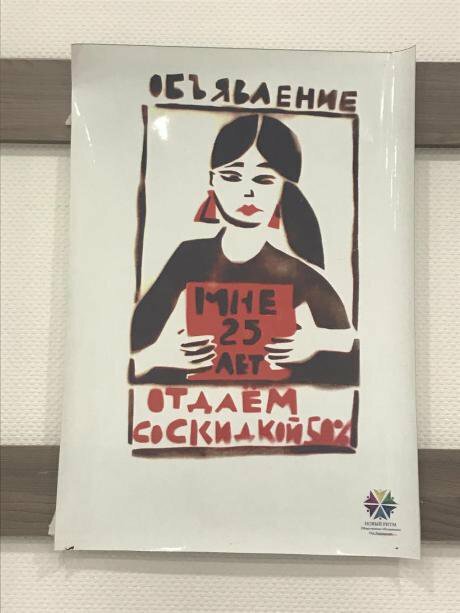 Albeit slowly, the struggle for gender equality has progressed in the country thanks to the efforts of a number of open-minded feminists among Kyrgyz women. Uzbek women, however, lag behind. The disparity in experiences between Kyrgyz and Uzbek women can be observed just strolling through the streets of the southern city of Osh, where both ethnic groups live side by side but rarely integrate – a state of affairs that has only been exacerbated by the 2010 conflict. Compared to young Uzbek women, young Kyrgyz women even appear more emancipated. In the morning, they can be seen going to work or university wearing the latest fashion. By contrast, young Uzbek women often appear in public dressed as kelin (young wives) and accompanied by their husband or mother-in-law, with a look of resignation to their second-class condition. “Announcement: I am 25 years old and there is a 50% discount on me.” Photo courtesy of the author. All rights reserved. A study conducted by the UN Women Country Office in the Kyrgyz Republic on professional and marriage choices by Kyrgyzstan’s youth captures this disparity well. Compared to young Kyrgyz women, who pursue higher education and are career-oriented, many young Uzbek women tend not to negotiate their educational, professional and marriage choices with their parents, husbands, and in-laws. This culture of obedience and subordination curtails their potential for educational and professional development, because of the preponderant influence of conservative and patriarchal principles among Uzbeks, according to which a woman needs to sit at home and early (and even forced) marriages are the norm. On a hot Friday last July, the imam of the Al-Ansari mosque in one of Osh’s Uzbek neighbourhoods delivered a sermon that exemplifies this misogynistic discourse. “You men are responsible for your wives, daughters, sisters, sister-in-laws, and mothers! You men should not be dayus (who let their wives go out, who “share” their women with others),” the imam said. “Do not let your wives wonder out and about! Do not let your wives go to cafes and restaurants, where they encounter other men, because they will look at your woman. Keep the women at home. If they need to go out, put their hijab on and accompany them,” he continued. According to some people in attendance, this mindset is the result of the prevailing patriarchal culture and Saudi-inspired conservative interpretation of Islam which has gained currency among Uzbeks in Kyrgyzstan. An increased focus on religion and traditions among Kyrgyzstan’s Uzbeks has significantly contributed to this misogynistic attitude. However, it is problematic to isolate Uzbek culture as the reason for gendered mistreatment, as it is very similar to Kyrgyz culture. Moreover, many Kyrgyz are also becoming more religious but, in spite of this, gender activism is growing among Kyrgyz women and even male feminists. A crucial factor that contributes to limiting the space for gender consciousness and activism among Uzbek women is the growing marginalisation of the Uzbek population as a whole in Kyrgyzstan. 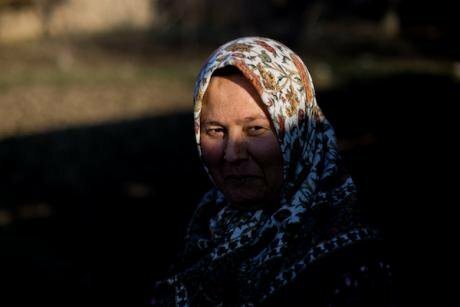 Kyrgyzstan’s state-led discrimination against Uzbeks, including the official policy to marginalise the Uzbek language in favour of Kyrgyz, has worsened since the 2010 conflict, fostering gender inequality among Uzbeks in the country and severely damaging the Uzbek population’s trust in the state. Uzbeks now prefer to live in their own neighbourhoods, with little interaction with the majority Kyrgyz. Rasohodjaeva, 25, works for Novi Ritm (“New Rhythm”), an NGO where Nafisa also volunteers to promote a peaceful, democratic and equal Kyrgyzstan. Both girls are Russian speakers and do not consider themselves fluent in Uzbek. Yet the majority of Uzbeks are not fluent Russian or Kyrgyz speakers, which means they are excluded from alternative sources of information to religious and traditional literature, as this is not readily available in the Uzbek language. Uzbeks in Kyrgyzstan have suffered from limited access to information due to language restrictions fostered by Kyrgyz state policies. The number of high schools with Uzbek as the main language of instruction has drastically fallen since the 2010 conflict, and in 2014 the government abolished university entry exams in Uzbek. This has discouraged students at Uzbek high schools from continuing their education, as they question the logic of studying in Uzbek for 11 years before taking a general university entry tests in Kyrgyz or Russian. “Now the neighbors will not condemn.” Photo courtesy of the author. All rights reserved. “All these developments happened too quick. Had there been a representative of the Uzbek population in Parliament, they could have publicly voiced that education is important to integrate the Kyrgyz and Uzbeks of Kyrgyzstan,” Novi Ritm project manager Guliza Abdyzhaparova told me. “Sustainable development hinges on the fair representation of the needs and concerns of different people. Uzbeks, especially Uzbek women, are left out of development programmes. The combination of patriarchal culture, lack of information in the Uzbek language, and discrimination have led Uzbeks to turn inwards. Consequently, uniting Kyrgyz and Uzbek women through gender activism is becoming less feasible,” Abdyzhaparova concludes. Civil society in Kyrgyzstan has not been immune from these trends. Relevant information on the importance of education, gender equality, female healthcare, early marriage and domestic violence are rarely available in Uzbek. In addition, the Uzbek population of Kyrgyzstan is often excluded from development projects, and is rarely encouraged to participate in awareness raising activities organised by international organisations and NGOs. 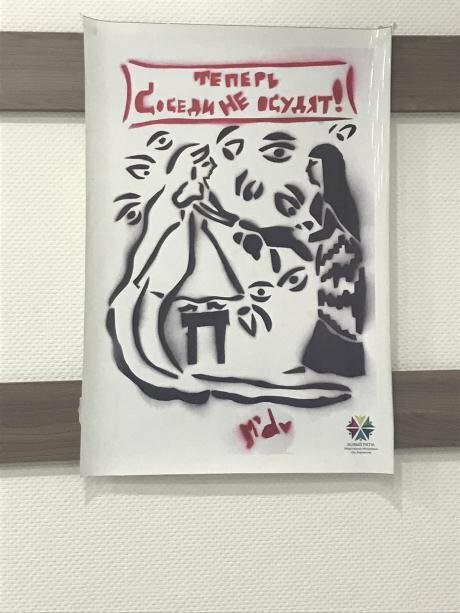 Kyrgyz women are slowly organising to fight the injustices society imposed on them, such as bride kidnapping and forced marriages. But this trend has not caught up among Uzbeks, where women-led activism lags behind. Kyrgyz and Uzbek women have proved unable to unite for female empowerment. Gender could be a rallying point for women in Kyrgyzstan to act together for the common good, but ethnic identity has hindered the potential for solidarity, at least so far. As a minority, Uzbeks in Kyrgyzstan are left outside development programmes initiated both by the government and civil society. This lack of support and inclusion encourages isolation and reinforces traditional ways of life. Both Uzbek men and women have seen their position worsen in Kyrgyzstan, but the latter face double discrimination: as ethnic Uzbeks in Kyrgyzstan and as women within their own ethnic group.